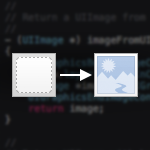 Now converting a UIView to a UIImage is nothing new, and there are lots of folks and forums out there that have posted solutions. However I still think it’s nice to keep the following snippet of code on hand, be it as an instance or class method, or even by extending UIImage with a category. One thing that has tripped me up in the past is the arguments in the UIGraphicsBeginImageContextWithOptions function used in the first line of this method. As specified in the UIKit Function Reference, the 3 arguments are CGSize size, BOOL opaque, and CGFloat scale. Most specifically, it’s worth noting that by setting the scale argument to 0.0, the scale factor is set to the scale factor of the device’s main screen, which is helpful to do when dealing with retina- and non-retina displays. Again, nothing new or earth shattering, but a good but of code to keep at the ready.